A high-level bilateral visit in New Delhi this week demonstrates the myriad areas of cooperation between the two. Nguyen Phu Trong, the general secretary of the Communist Party of Vietnam, is about to conclude a major bilateral visit to New Delhi. The visit seems to have reinvigorated the already-warm relationship between the two Asian countries, and saw agreements affecting the future of the India-Vietnam relationship in the South China Sea (SCS). Beginning with this visit, New Delhi will be spending the next few months on its diplomatic calendar looking east, with South Korean President Park Geun-Hye and Japanese President Shinzo Abe also expected in New Delhi soon. Over the course of the visit this week – the third such major bilateral visit conducted by Vietnamese officials since 2011 – India and Vietnam signed several agreements and a major Memorandum of Understanding (MoU). If there were any doubts about the strategic breadth and depth of the relationship – which was upgraded to a strategic partnership in 2007 – the agreements should put these doubts to rest. India made strides in the long-delayed realization of its “Look-East Policy” by extended a US$100 million credit line to the Vietnamese for defense purchases. The Vietnamese have expressed interest in the India-Russia jointly-developed BrahMos supersonic cruise missile. Additionally, the two signed an air services agreement to increase direct air travel between the two countries and an agreement to set up a “high tech crime lab in Hanoi” – something that had been discussed earlier this year. The lab, known as the Indira Gandhi Hightech Crime Lab (IGHCL), is supported by an Indian financial grant that was also agreed upon during the current visit. On the trade front, the two countries set a bilateral trade target of US$7 billion by 2015. Vietnam awarded an important contract to India’s Tata Power Ltd. for the “development of the Long Phu 2 coal-fired power plant project in Soc Trang, Vietnam,” according to the Indo-Asian News Service. India marked a landmark in its diplomacy by, for the first time, gifting a supercomputer to another country – Vietnam’s PARAM High Performance Computing Facility at the Hanoi University of Science and Technology will be powered by the computer. India’s aggressive generosity across the board seems to have paid off. In return for its encouraging engagement with Vietnam, the Vietnamese stated that they appreciated India’s “constructive role” in the South China Sea. India is clearly interested in drawing Vietnam squarely into its sphere of influence to balance China in the region (as is Russia), and the two have an increasingly deep level of defense ties. India has provided support and training for Vietnamese submarine crews. India’s approach to Vietnam has changed from one based mostly in post-colonial solidarity to one increasingly based in strategic foresight. The economic side of the relationship did not really open up until recent years given the delays in liberalization in India and Vietnam’s economic insularity under its communist regime. The relationship’s major strategic complementarity lies in the fact that as they build up their relationship, both India and Vietnam will find themselves with increasingly more leverage against China. For India, Vietnam is a pivotal node in its attempt to blur the lines between its Indian Ocean and SCS interests. The Vietnamese have always seen India as an important Asian partner, recalling its support during the Cambodia-Vietnam War decades ago. 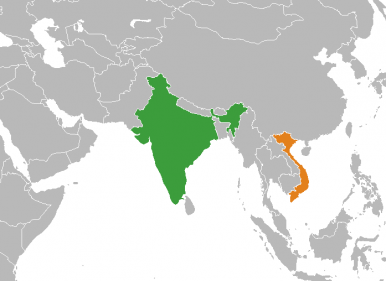 India, in Vietnam’s strategic outlook, is a viable counterweight to China. In recent years, Vietnam has been keen to invite India into the South China Sea for oil and resource exploration. It even went to the extent of offering India exploratory access within sections claimed by China (India chose not to pursue the option due to the technological unfeasibility of resource extraction). Vietnam is sure to continue courting India as a major partner given India’s receptiveness. As the two continue to cooperate on defense and energy matters, the relationship can only grow more important in determining geopolitical outcomes in the Indo-Pacific region. What will it take for India's relationship with Indonesia to progress to the next level?